Just that first name alone conjures up so much imagery, so much cultural currency, so much good feeling for generations of people. Born in Tupelo, MS and raised in Memphis TN, Elvis was an eighteen year old who recorded a single at Sam Phillips’ Sun Records studio for his mum one day in 1953 on the occasion of her birthday as a gift to her; “My Happiness/That’s When The Heartaches Begin“. Who did he sound like? Well, he didn’t sound like nobody. From there, the landscape of popular music, and the barriers that existed between musical genres at the time, would be changed forever. From the cramped studios at Sun Records, to Hollywood movie sets, to Las Vegas residencies, to global satellite transmissions from Hawaiian stages, Elvis weathered all those changes besides. What also changed was the man himself of course. By the end, he was no longer the earnest American boy with a singular talent for musical interpretation of anything thrown at him. He had become transformed into something more; a cultural avatar of almost religious stature. Those who came after him, carrying legendary mythologies of their own, all held him in the highest esteem. Even to his peers, he was The King; a messianic figure who stood above all of the trends, and enjoying the seemingly unconditional love of the masses up until his death at the young age of 42 on August 16, 1977; thirty-eight years and a day from today in the year that would have had him celebrate his eightieth birthday. Since his passing, the mythology surrounding Elvis has endured in the imaginations and the works of many. Here are ten songs about Elvis, or at least ones that touch on his cultural importance. Some are down to earth and humourous. Some are profane. Others are almost Biblical in their veneration of that boy from Tupelo who made good. Overall, the range of songwriting styles and musical textures shows that even though he’s gone (or is he? ), Elvis’ musical and cultural reach remains extensive even today. I have a love/hate relationship with Christmas music. It tends to walk the tight rope between the sublime and the unbearable, with many perceptions on those points being pretty wide too. As such, even though it’s a popular move, I think the idea of releasing a Christmas single, or even a whole album, to me is kind of a risky move artistically speaking. But, that’s what artists do; they push the envelope and they take the big risks. Or they go right for the cheese with impunity, knowing that a lot of people groove on Christmas music, whether they expect it from the artist in question or not! An important aspect of all this is simply that I really want to love Christmas music. So, often it works out for me. It’s amazing what simple willingness will do for you. So, this year, I thought I’d gather another collection of Christmas songs from the rock and pop and jazz quarters, representing the best of the bunch (or just the most unexpected and weird and completely sentimental) just like last year. Well, ten of them anyway. Some you’ll know, some maybe you won’t. But, either way, here’s hoping that some of these tune will find their way onto your own personal Christmas mixes this year – even if you don’t celebrate Christmas! It is a decade that is very often maligned by rock and classic pop fans, particularly those who followed some of the innovators of the form from the 1960s. The ’80s were pretty hard on the artists of that previous era. And why was that? It could be that the ’80s had become a producer’s decade, a time when digital technology ruled the roost over the warmth of analogue technology of decades previous. This not only affected the way the records sounded. It also affected how they were recorded, too. Further, the ’80s was the first decade in which youthful visages on a TV screen became inextricably linked to mainstream success, forcing many veterans to rethink their presentation, sometimes with not-so-great results in the wardrobe/dance-move department. Quite simply, there was a new generation of competitors for the (dollar) attention of the average music fan. The veteran artists themselves who had established the rules of popular music in the ’60s were in a new arena, with time having marched on in all kinds of ways. Needless to say, it seems like a given to say that most iconic artists of the Love Generation didn’t have a very good decade in the age of the Rubik’s Cube, the 20-Minute Workout, and the fuschia legwarmer-headband combo, at least not in terms of their comparable output in each period. But, this is too simple to be true across the board. Through it all, some very good music was made, maybe against all odds. Some of it was because of the new technology and approach that the decade offered which opened up stylistic possibiities. Some of it was inspite of that technology, with the artists turning to their considerable artistic strengths and experience in the face of younger competitors and new fangled tools. Either way, here are 10 moments in the careers of the masters in a decade that was otherwise unkind to members of their generation and sometimes to them personally, critically speaking. There have been many vital legendary musical venues that have helped to shape the destiny of pop music. 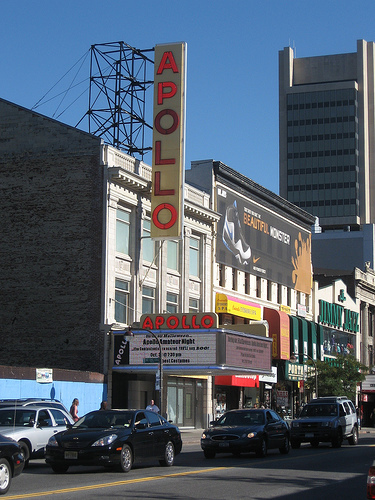 But, few have the pedigree of the immortal Apollo Theatre in Harlem, New York City. Since it was founded in 1934, several of the musical acts that now stand as pioneers in jazz, blues, soul, funk, rock, and hip hop got their start in this otherwise humble theatre located at 253 West 125th Street. And while these artists developed from beginners, to practicioners, to exemplars, and onto immortality, the world changed as a result. Their work helped in breaking down barriers between musical styles, and also between groups of people who had been separated by the oppressive social norms of their times. As these norms were torn down (and good riddance), the music they made has endured, and the lives of music fans everywhere have been enriched. Listing every artist that came out of the Apollo Theatre, or had career-defining shows there, would make for a very long read, indeed. So, as is my custom here at the Delete Bin, here is a list of 10 that I hope will suggest the wide spectrum of talent they represent. Take a look! From the mid-60s and into the 1970s especially, a new trend in music journalism ramped up into high gear. It was the only one that would rival the whole “will the Beatles get back together?” question that helped to mark those times. That question was: who is the next Bob Dylan? During the course of his career Bob Dylan took a lot of risks; going electric, changing his voice from time to time, quitting the touring treadmill for almost a decade, and making records that people didn’t expect him to make. And he’s still doing it today – Christmas In The Heart, anyone? That most of these risks tended to pay off was beside the point. But, during the eighteen months that everyone had to wait as Bob recovered from his motorcycle accident in late 1966, maybe the label, the fans, and the press perhaps realized that putting all their eggs in one basket was the riskiest move of all. As a result, a lot of performers would be tagged with the whole “Next Dylan” or “New Bob Dylan” labels, despite the fact that Dylan himself was still very much in his prime. Maybe this was because it was just a safer bet to hang one’s hopes on a new artist just starting out, than on one who continually made himself a moving target. In some respects, the comparisons were meant to be complimentary to these new artists. But, as some of these artists evolved, audiences began to see that they weren’t the next anyone, other than themselves – original voices. This is how it should be. Sometimes, cover versions totally make sense, an obvious fit even before you hear them. Of course that mall-punk band will try out “Another Girl, Another Planet”. That blues group will assuredly play “Stormy Monday”. That pop princess will definitely try to sing that soul favourite to establish her cred. The quality of the results are another question, of course. But, what about the cover version that comes completely out of nowhere, that has seemingly no relation to the act in question? What about the ones that, in their original forms, actually work against the sound, scale, or the set up of that act? What if those acts are defiant, kick irony to the curb, and play it straight in their own way, and damn the consequences? To celebrate this phenomenon, here are 10 cover versions that are surprising, that perhaps really shouldn’t work, and yet do so anyway. Some of them were done live, and many not recorded formally. Others were b-sides, deep-cuts, or rarities. Some were even big hits! The popular music spectrum is well-represented here, stylistically speaking. But, in some ways, they’re all punk rock. OK, wait. Just stop. Never mind. The whole ‘scary voice ‘ thing doesn’t work so well in print. But, Hallowe’en is almost here, with ghosts and goblins about to hit the streets. Or is that Transformers and Disney Faeries maybe? Either way, I thought it was high time for some spooky tunes from across the decades of pop-tastic-ness to serve as soundtrack for the season. I have, as you can see, breezed right by “Monster Mash” and “Thriller”. They’re great tunes for this time of year, but … well, they’re too obvious, aren’t they? And I did “Monster Mash” last year. Moving on. Here are 10 others that aren’t those songs. Some of them are actually about real scary creatures of the night. But, could there be themes lurking beneath the surfaces of these songs, just waiting to pounce? Take a look! A smash 1981 single from the first tier of second wave ska bands, The Specials’ spooky tale was an anthem to some of the scarier things in the world at the time; unemployment, urban decay, poverty, hopelessness, violence, and the death of one’s hometown due to all of them. The scariest part of this song was that in early ’80s Britain, these ghosts were real. Unfortunately, all over the world including here in North America, they’re still haunting us. This one is a deep-cut from Vega’s 1999 record Nine Objects of Desire. This song reminds us that ghosts can of course exist in relationships too. Here in this tale of visitations, secrets, and old, possibly haunted hotel rooms, we have a prime example that sometimes even when we’re close to someone, they carry ghosts around with them that we can’t always see. You want really scary? How about an electronic, 10-minute, minimalist, almost-spoken tune about inner-city desperation that leads to a double-murder and suicide, delivered by a band who is indeed called Suicide. Besides the out and out terrifying yowls from vocalist Alan Vega on this track from their 1977 self-titled debut, one of the scariest things about this is how this drama is playing itself out at various stages all over the world right now, with poverty, anger, and mental imbalance creating some truly tragic situations. Would being a ghost be so bad? Tori Amos doesn’t think so on this song, taken from 1992’s Little Earthquakes, chasing nuns out in the yard, not needing an umbrella, and waking up in Strawberry Fields every day? But, is this just about being a mischievous spirit, or about feeling like a ghost when you’re still alive, feeling isolated and perhaps feeling disconnected from one’s identity, or perhaps tied down by another’s perception of what that identity should be? You be the judge. Every teenager feels awkward, with a transforming body that is doing so beyond their control. Puberty, youthful angst, and lycanthropy are pretty closely connected that way. And just to make it more interesting, let’s set that theme it to some twangy punkabilly while we’re at it. The Cramps recorded this one for 1980’s Songs The Lord Taught Us, while referencing the 1957 film I Was A Teenage Werewolf (starring Michael Landon!) that made that very same connection. The band would make a career of writing punkabilly tunes that matched horror images with the whole experience of feeling weird and out of place as a teenager. Halowe’en is a time when we think about mortality, and the afterlife if we believe in one. Johnny Cash is the voice of doom on this 1979 cover of the well-worn and popular Country & Western hit originally written in 1948, and covered many times since. Cash makes this song about cowboys cursed to chase the Devil’s Herd for eternity into a song that is less about damnation, and more about redemption. Come to think of it, he made a lot of songs sound that way. What’s more terrifying than love? In this song, it’s about the hold that it often has over us, making us do things that perhaps surprise us, haunting our dreams and not being (often) what it seems. Dusty knows! Dusty Springfield recorded this for her 1968 Dusty … Definitely album, with her light-as-air, and almost spectrally beautiful voice. Is being a vampire about being handsome, sparkly, and making out with cute women? No, says Sting. Based on his reading of Anne Rice’s novel Interview With A Vampire, Sting describes the vampire as one who is cursed to love what he destroys, and being doomed to destroy the thing he loves. The most frightening idea of a ghost isn’t about being confronted by something external that will hurt us, but rather about being disconnected, spiritless and abandoned. This is what this song, taken from Patrick Wolf’s 2005 record Wind in the Wires is concerned with; our spirits wandering free and independent of us, not connected to our lives. Like in Tori Amos’ song, the real fear of ghosts is about acknowledgement of what’s really important to us and about us being out of reach. The poet laureate of Hallowe’en is Edgar Allen Poe, with a number of stories and poems that capture the spirit of the macabre which we love so well at this time of year, and all year round. Lou Reed acts as something of a musical curator here, while actor Willem Defoe reads Edgar Allen Poe’s most famous poem (with some new material from Reed) from the 2003 album The Raven. Like Poe, Lou Reed has had a history of chasing the darkness, and danger, while also trying to capture what it’s like to experience the pleasures and pains of that through his work. Sometimes, the darkest obsessions make for the greatest art. Humanity and the supernatural have had a close connection since civilization began. And so, as our little ones (and some big ones, I’ve noticed) galavant around our neighbourhoods hoping for more chocolate, and fewer of those crappy toffees that everyone gets, remember that Hallowe’en is at least in part about our cultural acknowledgement that our dark side exists, and is very much an integral part of the human experience. Maybe that’s why we celebrate Hallowe’en. Maybe underneath the commercial veneer, that’s the point of it. So, just as we did for 10 Summer songs, it’s now time to turn our attention to my personal favourite season, which is Autumn, or Fall. It’s such a great season, it’s got two names (depending where you’re from, I guess). Autumn is known to be a time when the natural world is about to take a long nap. But, it’s also a season of reflection, too. Autumn is a time of beautiful melancholy, of wistful feelings of things past, and even of mourning. It’s a time when things get a bit dimmer earlier even if vibrant colours abound. It’s kind of a contradictory season in that way, which makes it the most compelling time of year for songwriters of various stripes to be inspired to take on the subtle emotional charge that autumn seems to provoke in many. Come to that, this kind of contrast between between beauty and melancholy is what I appreciate in music as a listener as well. So, with that thought, here are 10 autumnal tunes of greatness from across musical history, and with several musical traditions represented. Perhaps the overt jubilation of Summer isn’t to be found here. But, the beauty to be found in reflecting on Summer’s past sure is, as is the appreciation of what memories we’ve made in a season gone by. To me, that’s the spirit of Autumn itself. Take a look, and see if you can hear it. The Beatles took separate projects in 1966 when they stopped touring for good that year. John Lennon went to Spain to film Richard Lester’s How I Won the War. George Harrison sped off to India for the first time to take sitar lessons from Ravi Shankar. Paul dreamed up a way for the band to continue by having their next record sound like the work of a touring band, even if it was the Beatles once removed. Ringo contemplated a film career too, which would come to fruition in the ensuing years. But despite their individual pursuits, when the Beatles reconvened in November of 1966 for the recording of the ‘Strawberry Fields Forever/Penny Lane” double-A side they shared one thing in common. They had all grown mustaches. Since then, mustaches have been a mainstay in rock from Frank Zappa’s signature ‘stache-n-patch, to the 1800s preacher-boy look of the Band, to Freddie Mercury who led pomp-rock gods Queen to glory, mustache-first. 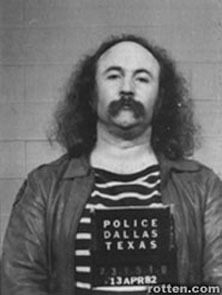 David Crosby grew one after leaving the Byrds, showing a commitment to a facial hedgerow that endures to this day. U2’s the Edge experimented with a myriad of mo’s, appropriating and discarding them seemingly on a daily basis. Here are 10 songs by 10 mustachioed rock and pop artists, some who have stayed true to their ‘staches, some who went through a phase and wisely abandoned it, and others who once wore the ‘stache proudly and the ‘staches of which are sadly no longer with us. In any case, in honour of the Movember Men’s Health Charity, I give you ten unshaven upper lips of the upper echelon. James Marshall Hendrix revolutionized the guitar, first serving time as a sideman to Little Richard. From Richard, he learned that he couldn’t hang back like a sideman should. But, perhaps also, he learned the power of Little Richard’s ‘stache as a rock ‘n’ roll accessory of choice. And who knows? Maybe the ‘stache was the key to Hendrix’s ability to shred? Among their skills as Canadian hit-makers who had some play in the States, despite hailing from the Canadian prairies (Winnipeg, actually), they had an advantage in lead singer and keyboardist Burton Cummings, who’s mustache has become a national icon. You know that one relative who’s always had a mustache, and you can’t imagine him without it? Think of that on a cultural scale, and you begin to see what Burton Cummings’ ‘mo means to every Canadian, everywhere. This man really is the Walrus, defining the ‘Dan’s early career as dual-guitared jazz-rock champions, and defining the extent to which one man might seek to entirely hide his mouth using his own hair. 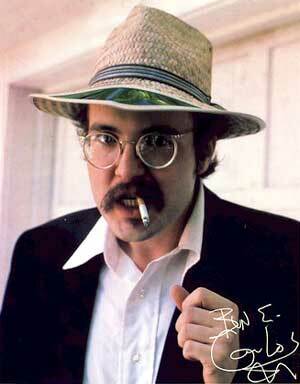 And if you think the ‘stache is only for unwashed, peace-loving hippies, think again! Not only is this ‘stache still around today, it remains on the face of a man who’s had a second careering in designing guidance systems for missles. If Adolph Hitler stole Charlie Chaplin’s ‘stache in the 1930s, then Ron Mael has been trying to steal it back ever since he could grow one. I think all would be well, if Mael looked any less insane than Hitler. But, he doesn’t. At all. Guitarist for Joy Division and later the same for New Order, Bernard Sumner’s brief flirtation with a ‘bumfluff’ mustache at the end of the 1970s has become legendary. Even in his 1999 guest vocal on the Chemical Brothers “Out of Control” contained the telling line “is my mustache too much?”, proving that mustache shame (or is it envy) can dog you for decades if you play it wrong. Bassist Peter Hook of course hedged (pun intended?) his bets by sticking to his unfashionable beard. There were very few bands pulling this look off in the early 80s. But, nearly every member of this unique disco-pop outfit, despite the differences in costuming, had a ‘tache they could be proud of. Cop ‘tache? You bet! Cowboy ‘tache? Check. Biker ‘tache? What, are you kidding me? The Village People showed that no matter what your walk of life, there was a mustache out there for everyone! It was a ‘first mustache’ for many a special friend on the road. If Smalls was the lukewarm water between two creative fire ‘n’ ice forces in the ‘Tap, then he is smokin’ hot on the ‘representin’ the ‘tache’ front for his otherwise clean-shaven band mates. John Oates was the mustache of the decade in the ’80s, his visual trademark during a very fruitful run of smash singles with Daryl Hall from 1976 to 1986. Sadly, his mustache is no longer with us, even if (luckily) John Oates is. He shaved it off! Can you believe that!? There was a time when people thought George Michael was straight. No, honest. At one point in his career around the time this song was on the radio, he rocked a Pancho Villa vibe when it came to his moustache, a look not many reached for in 1996. Nick Cave, with the Bad Seeds – Dig!! Lazarus Dig!!! Nick Cave has stuck by his haircut – sort of a gothic mullet affair – from the 1980s when he made his name as the frontman for the Birthday Party. Yet, lately he’s sported a droopy outlaw mustache, kind of like he’s keeping it for a friend. OK. It’s full disclosure time. I am growing a mustache, participating in the aforementioned Movember event to raise awareness and money for prostate cancer research. Should you wish to support said mustache, click here to do just that.